The winter season is upon us, with a lack of daylight hours, cloudy days and temperamental weather. And so we pack on the winter pounds, get the winter blues, and go into relative metabolic hibernation until spring arrives. But what if we could circumvent some of this seasonal downturn in our health? Cancer. Improving calcium and vitamin D nutritional status substantially reduces all-cancer risk in postmenopausal women. This was suggested from a study in 2007 of more than 1,100 women in Nebraska, in which treatment with Vitamin D and blood levels of Vitamin D were found to be both linked to a reduced incidence of all cancers. Multiple Sclerosis. A recent study performed by the U.S. military looked at more than 250 cases of multiple sclerosis, and found that those who had higher levels of Vitamin D in their bloodstream were at lower risk of developing MS.
Insulin-dependant diabetes. A study of children born in Finland in 1966 and followed for 30 years showed that those who had supplemental Vitamin D in their first year had a significantly lower risk of developing insulin-dependant diabetes, and those who had rickets (severe vitamin D deficiency) had a much higher risk of developing insulin dependent diabetes later in life. Rheumatoid arthritis. Postmenopausal women with the highest total vitamin D intakes were at significantly lower risk of developing RA after 11 years of follow-up than those with the lowest intakes. Osteoporosis and Fractures. Many studies suggest that vitamin D3 supplements of at least 800 IU/day may be helpful in reducing bone loss and fracture rates in the elderly. Cognitive functioning. 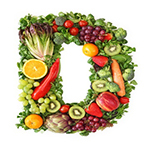 Vitamin D deficiency has been linked to decreased cognitive performance in older adults. Depression. Low vitamin D levels have been linked to low mood and depression, with one study showing blood Vitamin D levels 14 percent lower in people with major and minor depression as compared to non-depressed patients. Despite these numerous health benefits, surprisingly, more than half of all adults and children are deficient in Vitamin D, according to a 2008 report in the American Journal of Clinical Nutrition. So what should you do in the winter to ensure that you are getting enough Vitamin D to offset the lack of vitamin D from sunlight exposure? You could try to obtain Vitamin D naturally through a few foods, including some fatty fish (mackerel, salmon, sardines), fish liver oils and eggs from hens that have been fed vitamin D. You also can take Vitamin D in the form of a supplement. In 2010, the Food and Nutrition Board (FNB) of the Institute of Medicine set a Recommended Dietary Allowance (RDA) based on the amount of vitamin D needed for bone health. It is recommended that most adults take 600 IU of Vitamin D, with those over 71 recommended to take 800 IU of Vitamin D in supplementation. Those most at risk for low Vitamin D levels include people who are older, have diabetes or kidney disease, stay indoors, are obese or have darker skin. Drs. Kay Judge and Maxine Barish-Wreden are medical directors of Sutter Downtown Integrative Medicine program. Have a question related to alternative medicine? E-mail adrenaline@sacbee.com.